WHAT A FANTASTIC year SingMe Merseyside had in 2016. From humble beginnings just 2 years earlier, there are now over 250 SingMe members attending 8 different weekly classes across Merseyside and Cheshire. Add in 2 weekly SingMe Coffee Clubs in conjunction with Starbucks plus 118 performances and even a charity quiz night thrown into the mix and it all adds up to one of the most exciting, memorable and fun years that members and leaders have enjoyed for a long time! Celebrating SingMe Merseyside's receipt of the 2016 Arts Ambassador Award. Photo courtesy of The Wirral Globe. There was definitely no rest for the wicked especially on the festive run-up to Christmas with no less than 44 performances beginning with our appearance over 2 days at the Wirral Bazaar event at Thornton Manor which raised £34,000 for North West Cancer Research. There was even one occasion when SingMe Merseyside had 3 performances in one day! 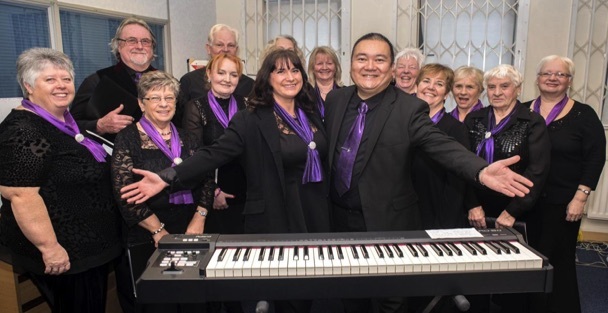 But the fun all started last January with a lovely performance at Bishop's Court nursing home followed closely by a charity concert at the Liverpool Philharmonic Hall for the city's oldest charity, The League of Welldoers. The start of the year also saw our first performance for Wirral Met College at their annual charity race night. February 2016 played host to the Chinese New Year of The Monkey celebrations and gave SingMe Merseyside the chance to premiere the Chinese New Year Song performed in Cantonese at several high profile events - native Chinese speakers were very impressed! The summer saw SingMe Merseyside at further outdoor events including opening the main stage of The Liverpool Loves Festival, 2 appearances at the Liverpool Pride Festival, The Little Sutton Summer Fair, The Wallasey Central Park 125th Anniversary and our welcome return to entertain the crowds at the Egremont Wirral Waterfront Festival. As we moved through the summer months, SingMe Merseyside continued its rewarding work raising money and awareness for local charities. A highlight was our appearance at the Azure Collection Charity Ball in the opulent Grosvenor Hotel Chester which raised over £45,000 for 4 separate local cancer charities in just one night. The autumn months were welcomed in with our annual SingMe Merseyside Variety Show, this year, supporting The Clatterbridge Cancer Centre. The show featured an eclectic mix of performers and artistes who delivered exceptional performances to the delight of the audience at The Floral Pavillion Theatre, New Brighton. See the full SingMe Merseyside write-up about this event plus pictures and a link to the full newspaper review in our archive section. SingMe Merseyside were also invited to deliver a monthly project for the Chinese Wellbeing Charity to teach singing to their beneficiaries as part of their focus on the health and wellbeing of the local Chinese community. And that neatly takes us full circle back to the launch of the SingMe Merseyside festive season. SingMe Merseyside are very proud to have received the Wirral Globe Ambassadors Award as recognition for our work as leaders in the field of arts and music locally. SingMe Merseyside Founder & Musical Director, Billy Hui and SingMe Merseyside Choir Manager & Administrator, Wendy Williamson, were both honoured to receive this award at a small ceremony at the Wirral Globe offices on 1st December 2016 where we also had the chance to perform a selection of songs for staff and other award winners. Legends of Swing Festive Concert and for The Lord Mayor of Liverpool's Christmas Charity Concert sponsored by Smooth Radio where we had the pleasure of accompanying the wonderful Sedaka-esque Steve Macfarlane and spine-tingling mezzo-soprano Danielle Louise Thomas. Designer Outlet on 23rd December for Claire House Children's Hospice. Storm Barbara blew in and curtailed our second performance but we still managed to raise some money and awareness for this fantastic charity. We visited this charity again at their headquarters in between Christmas and New Year to entertain the children and staff. It was fabulous and thoroughly enjoyed by both Claire House and the SingMe Choir alike. We were honoured in May, to perform a brand new medley that was specially commissioned for our appearance at the BBC's 75th commemoration of the WW2 May Blitz "An Unconquered People" at Liverpool Anglican Cathedral. 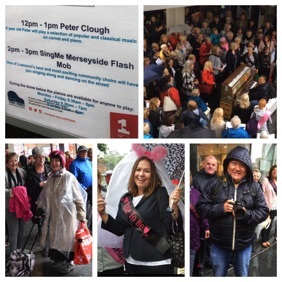 160 SingMe Choir members performed our very own Liverpool Songs Medley to finish the show which featured BBC Radio Merseyside presenters alongside actors including Craig Charles, Leanne Best and Eileen O'Brien. Ultimately, the quality of the show shone through and went on to win a national radio academy award for drama. Liverpool where both staff and carers sang along to some lively material performed by their very own SingMe Local Solution singers. performances. These included a fantastic performance at the National Gardens Scheme Open Garden fundraiser for Wirral Hospice St John's in a rather nice suburban Heswall garden plus the now infamous Hawthorns Residential Care Complex barbecue where not only do we enjoy the fabulous food but SingMe choir members are very, very lucky when it comes to winning prizes in the raffle! One, unnamed, SingMe Chester member won 6 prizes and then followed it up by winning a laptop computer at another event just a week later! We also returned to perform several times for The Tickle The Ivories Piano Festival in Liverpool One, but this time with a twist. We decided to stage a flash mob on a busy Saturday to raise money for Wirral Citizens Advice Bureau. It rained. But that did not stop SingMe Merseyside singers from performing our Motown Era Medley especially after such a well planned-out way of tricking shoppers was devised. In his ultimate wisdom, SingMe Merseyside Founder & Musical Director, Billy Hui, truly hammed it up by deciding to play a Chinese tourist as part of the set up - ruck sack, big camera 'n' all. The crowd was well and truly fooled as 2 young gentlemen even offered to teach him how to play piano as Billy did his best "Les Dawson" on the upright piano placed strategically in the centre of the Liverpool One shopping complex. One of the city's most famous exports are, of course, The Beatles. So it was fabulous for SingMe Merseyside to perform as part of the premiere of Beatles film "Eight Days A Week". It was made extra special because we performed a collection of Beatles favourites alongside the award-winning Liverpool Signing Choir. Wonderful. had the pleasure of performing for them at their city centre takeover event on Williamson Square in Liverpool. Another highlight was working with exceptional soloists for The Sounds Of The Musicals show at The Little Theatre Birkenhead and The Brindley Runcorn. SingMe Founder & Musical Director, Billy Hui, provided full live accompaniment for the production with a team of specially selected musicians. The SingMe choir especially enjoyed singing Bui Doi from Miss Saigon at this very well received show. 39. Wirral Met College Hair and Beauty Gala show "What A Wonderful World"